Peter Robinson described the threats to the Celtic players as "vile sectarian behaviour". The NI First Minister has condemned those who sent bullets in the post to Celtic manager Neil Lennon and player Niall McGinn. 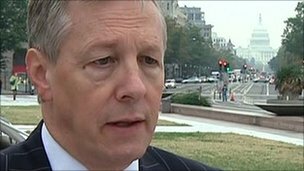 Peter Robinson said those behind the threats were guilty of "vile sectarian behaviour". Celtic have not formally commented on the bullet threats but Mr Lennon tweeted that they were "stupidity". The First Minister also condemned pipe bomb attacks in north Antrim over the weekend as "dastardly efforts of evil people". A community centre on Crosskeys Road in Ballymena, as well as a GAA club in Portglenone and a primary school in Ahoghill were targeted over the past two days. Mr Robinson said: "All right thinking people from throughout the community will utterly condemn those who posted bullets to Neil Lennon and Niall McGinn. "I strongly urge anyone with information about the identity of those responsible for this disgraceful incident to come forward and share that information with the police." Ulster Unionist MLA David McNarry also expressed his outrage at the incident. He said: "It is absolutely outrageous that any sportsperson should be subjected to threats of any kind let alone be the recipient of bullets through the post and I utterly condemn these actions. "I am at a loss as to what would motivate anyone to do such a thing in the first place."